The International Thermonuclear Experimental Reactor (ITER) is made of a consortium of nine countries and will be located in the south of France at the Cadarache Facility. The objective of ITER is to produce a sustained fusion reaction, one that generates 500 megawatts of energy from 50 megawatts of input power. This is a significant leap beyond current facilities that are designed around a Tokomak chamber. In comparison, the last major fusion project JET standing for the Joint European Tours, produced only about 16 megawatts of power for a fraction of a second. ITER is currently under construction and is targeted for completion around 2020 and will operate for approximately 20 years thereafter. If ITER is successful it will lead to the first power plant that produces more power than what it needs to start up. This is a fusion test reactor and it is not intended to generate power that is commercially viable. At the heart of all reactors, they generate heat, taking that heat via steam to run a turbine which is how electricity would be produced. In the ITER design there is no plan for a turbine to generate commercial power. Fusion is the combination of several light atomic nuclei like hydrogen, deuterium, tritium and/or helium and combining those to make a single entity fusing them together. The subsequent release of extra power held within the nuclei creates the heat of nuclear fusion. The problem with using fusion as a source of heat is that you must contain it. 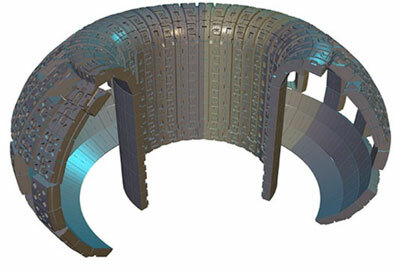 ITER will use magnetic fields to suspend the plasma (fusion) within a torus shaped reactor in order to control it so that the heat generated can be used to produce electricity. 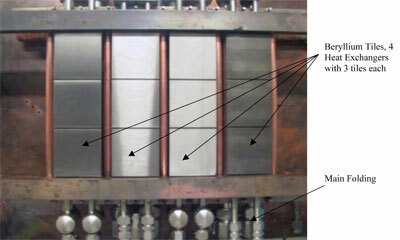 Levitating or suspending the plasma within a magnetic field has been proven in a number of previous Tokomak reactors. Where these have been smaller reactors, ITER is at least twice the size of any previous produced Tokomak reactor. 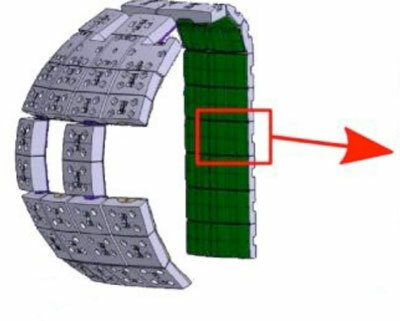 Peregrine was approached by Sandia National Labs approached to assist in the diffusion bonding efforts of beryllium tiles to the first wall of the ITER reactor. The first wall is the wall that faces the plasma and can be subjected to very high heat fluxes (>250W/cm2). The fusion energy is basically the heat of the sun and the first wall is the first surface that is exposed to the radiant heat. Peregrine has a long history with beryllium materials and assisted Sandia in this endeavor. The idea of attaching the beryllium tiles to the first wall was based upon a liquid interface diffusion bond. This is where a small amount of material is deposited between the beryllium tile and the subsequent heat exchanger in order to initiate joining between two parts. After the intermediate material gets the joining mechanism started it typically diffuses into the base material. This bonding process is performed under high pressure and temperature and is allowed to continue until a high quality metallurgical joint between the tile and the heat exchanger is obtained. As can be seen in Figures 2 through 7, there are over 400 square meters of surface area that needs to be covered with beryllium tiles. Behind the beryllium tile is a sophisticated heat exchanger based on copper chrome zirconium and stainless steel. The process was developed and then individual test heat exchangers were produced. 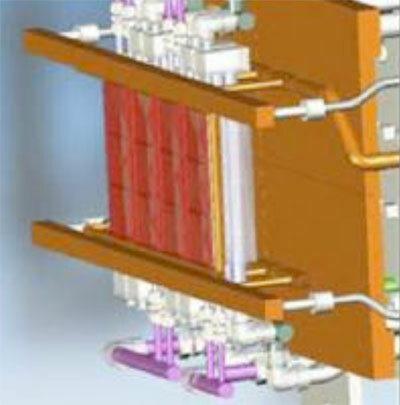 One of those heat exchangers (shown in Figure 6), was produced in conjunction with Sandia National Labs. Testing was then initiated as can be seen in Figures 5 and 7. Testing was successful and the process was proven out. The project is continuing and is anticipated to be complete late in this decade. The current participants in the project are the European Union, Japan, The People’s Republic of China, The Republic of India, The Republic of Korea, The Russian Federation and the USA. 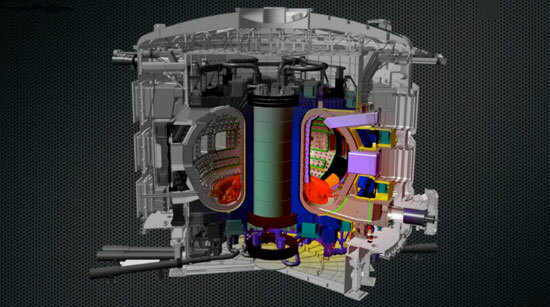 The goal of ITER is to demonstrate the scientific and technological advantage of fusion power for peaceful purposes. Peregrine continues to work with ITER and recently performed some development activity for the Cryogenic Viscous Compressor (CVC). The ITER vacuum system requires a roughing pump system that can pump the exhaust gas from the torus cryo pumps to the tritium exhaust processing plant. The gas will have a high tritium content and therefore conventional vacuum pumps are not suitable. A pump called the Cryogenic Viscous Compressor is under development for the roughing system to pump from roughly 500 Pa to 10 Pa at flow rates of 200 Pa-m3/sec. A unique feature of this pump is that it allows for any helium gas to flow through the pump. After flowing through the pump it is sent to a detritiation system before being recycled. © Copyright 1997-2019 The Peregrine Falcon Corporation, All Rights Reserved.